Is it Friday already? Why didn't the week fly by this quickly when I used to work fulltime outside the home???? We are LOVING the cooler temperatures that have settled in our area this week. For all I know, it could be back in the upper 90s next week, so we're definitely going to enjoy this while we can!! Windows are all wide open- FRESH AIR!!! A cute little kitty cat wondered up to our church Wednesday night after church. Two different families said they would take her home Sunday if she was still here. So what's our family to do? Well, feed her of course!! Elizabeth LOVED discovering her still here this morning. Mr. U and I are finishing up our homestudy work today. My most dreaded task, the scrapbook, is almost ready. I know, I know, most of y'all probably LOVE scrapbooking, but not me. I'm doing my best with our portfolio, though, because I know some sweet girl will see them one day and, hopefully, choose our family for the child she is carrying. Some friends of ours are having a housewarming party this weekend. Hmmm. What kind of gift should we take to a housewarming party? Any ideas? On today's menu is Sausage Lentil Soup and French bread with a dipping sauce that reminds me SOOOOO much of Carrabba's!! I'll be sure and share those recipes later on!! I've got a little tidying to do today and then I'll vacuum tomorrow night and wipe down bathrooms quickly. I do love to take care of our home. I hope everyone has a wonderful weekend!! Make time to be in the Word!!! I'm with you when it come to scrapbooking. I find it difficult (creatively) and I don't enjoy it. I'd rather quilt or bake or make soap. Whatever you come up with I am sure it will be great! Enjoy your weekend. What a cute kitten! We have two cats that adopted us. One showed up a couple of years ago and the other just a few months ago. They were adult cats when they came to live here. Now they are spoiled rotten. I wish it would hurry and cool off here. I have started decorating for Fall thinking that will rush things along! The lentil and sausage soup sounds so good. My youngest daughter and I watched Barefoot Contessa make some on Food Network the other day. I honestly don't think I have ever had lentils but it looked so good I want to make some. I have cleaned house all day and now I am going to take a bath and relax. Going to the huge flea markets in Canton, TX tomorrow so I know I will have a great weekend. Hope to come home with lots of goodies. Hope you have a great weekend too! I don't love to scrapbook either - just to busy for me! 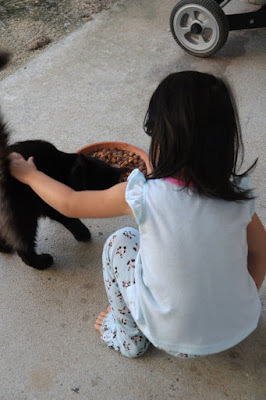 I am the cat lady, seriously, I have adopted so many stray cats. Lentil soup does sound so good - I'll bet I could find a great recipe in one of my hundreds of cookbooks! I don't really have hundreds, it just seems like it - It is certainly getting to be that time of year when we start thinking about soup and fresh baked bread! Your blog made me hungry - time for supper!